I write today’s post feeling proud of my accomplishments as the day draws to a close. Today I showered and crumbed the chicken for dinner. You know what though, I am proud of it. I did not think I would be able to prep dinner at all and was totally prepared to eat toast or a bowl of cereal. Yep, it’s been tough in our house the past 72 hours and last night I had 3 hours of sleep before Miss Bonnie woke, cried and cluster fed until the break of dawn. The Wonder Weeks app I mentioned the other day alerted us that she was in the ‘patterns’ change but we knew something was awry! Anyway I got her to have a sleep at about 6.30am. I showered, had breakfast and then had about 2 hours in dreamland with her. The rest of the day has been feeding, changing and feeding- all in bed watching telly. It’s just that kind of day. About a half hour ago, she had a cat nap and I quickly prepped dinner for later (something I like to do as dinner time seems to be chaotic here now.) I was so happy I got this done I couldn’t stop grinning. Today, I just had to let it go and accept my fate for the day. I wasn’t going to get to steam the tiles, or scrub the bathroom (both on my mental ‘to do’ list.) I stayed calm and went with the flow. For me, and I think a lot of mumma bears this can be a hard thing to swallow. I like to keep things tidy. I can’t lay around and relax if there are jobs to be done. I like to clean and organise the home and then totally chill with my mental household list checked off. So being able to let go of a whole day was a big leap for me. Also being proud of the small accomplishments I did get done. Not cursing the ones that didn’t get done! It just dawned on me I managed to wash Bonnie’s cloth nappies and hang them out too! Even more fabulous! As for hubby, I got a good one. He will be giving me a high five that dinner got prepped and nappies got washed too. He will be ecstatic that mental list of mine didn’t get a look in today. That’s today’s post feeling proud for crumbing Jamie Oliver’s chicken pieces. Living with iPhones and iPads only metres away all the time isnt always a great thing. However, two apps discovered in this household has been a life changer, In this instance I thank technology. Firstly, as I said yesterday, I really didnt know any of Bonnie’s feeding or sleeping patterns or how long feeds would go. It was when our lovely GP asked me to think hard I realised it was all a fog and felt I definitely needed to know more about our bubba’s daily habits. I initially planned to write it all down and was instantly tired by the thought of it. “There must be an app” I muttered as I started scanning through the app store while nursing Bonnie the other day. Yep, there totally is and it is awesome! 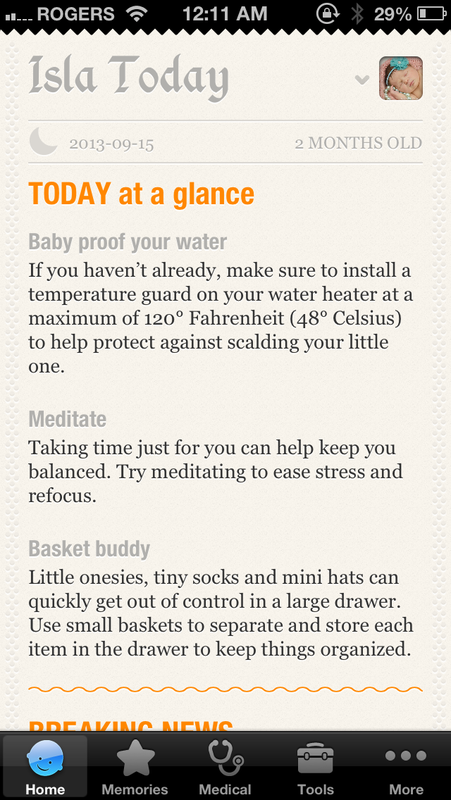 The Baby Sprouts app is free or you can pay $6.49 (AUD) to upgrade to premium (which I ended up doing.) 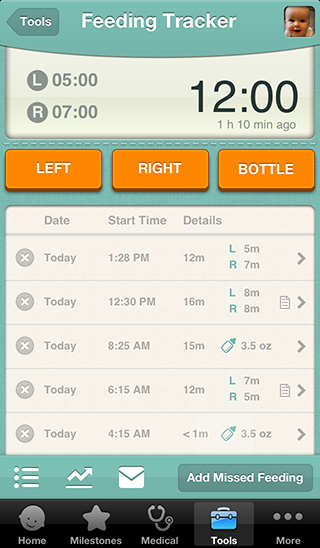 It tracks sleep, feeds (both breast and bottle), pumping, medications, activities, nappy changes, milestones and more. I am finding it super easy to use. When she falls asleep I open it up and hit ‘asleep’ and the timer starts. If I forget I can jump into the edit section and start the sleep/feed when it occurred. I can even enter an entirely missed activity too. 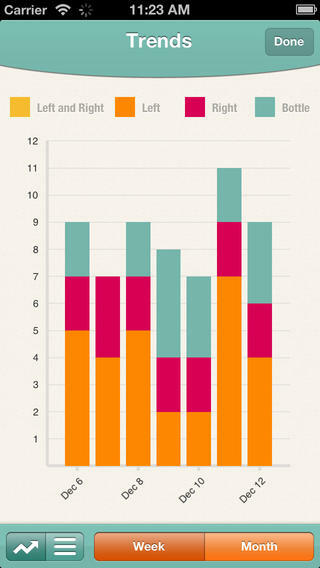 You can look at the data in charts or a simple written overview. You can share it with a babysitter or hubby too so they can jump in and add data and everyone can see. Additional children seem easy to add as well. Being able to track Bonnie’s activities has been super easy using this and it runs in the background so once the timer starts you can make a call, jump on pinterest and cruise around the net. This was the tool that made me understand Bonnie’s habits more (except last night – I don’t know what she was up to!) I realised she has a big morning sleep around 8.30am – 9am then has another big sleep around 2pm. I thought her feeds were an hour long but they were half that! It just felt longer haha. I now know she has a couple of shorter feeds in the evening before she enters dreamland for the night. As a couple we enjoy sharing her day as hubby can jump on at work and see that she has had tummy time (I can add photos too) and mat play and he doesn’t feel so distanced by work. We can also look at her milestones and see what is happening with her little self as the weeks continue. 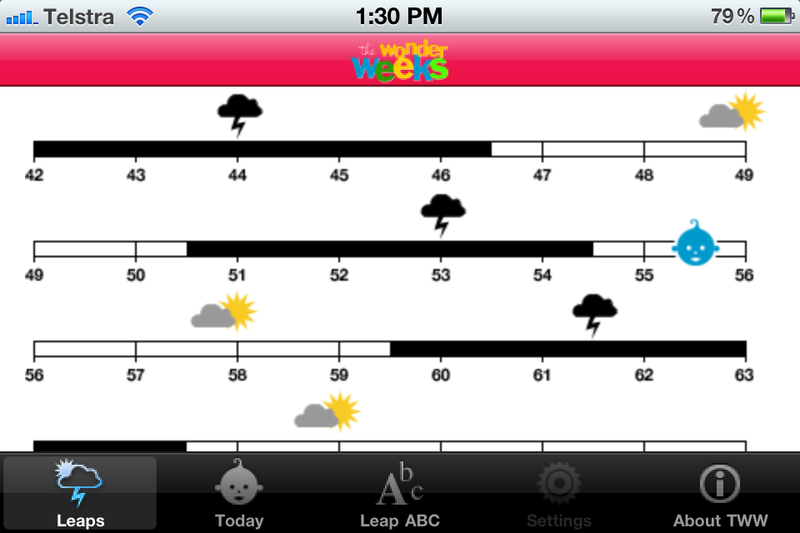 The second app we have used since arriving home is the Wonder Weeks app. 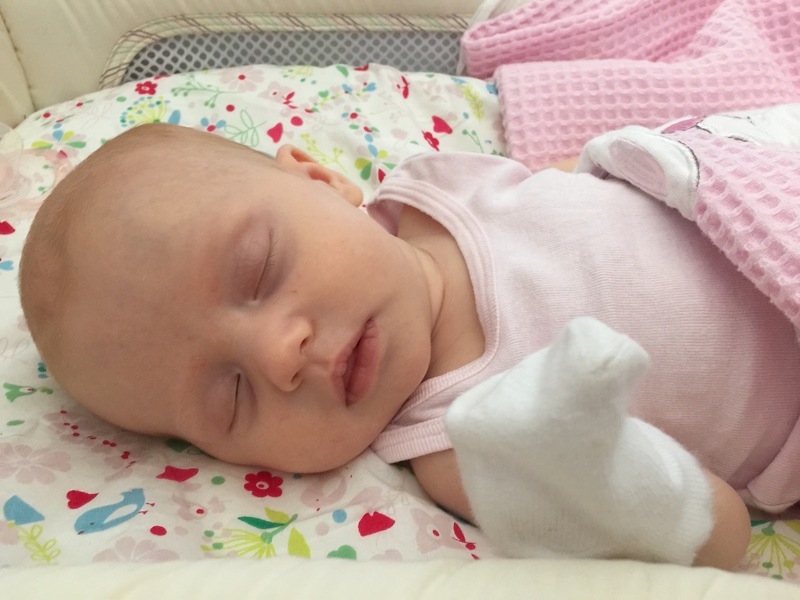 A midwife at the hospital told us about it and it helped when Bonnie Mae hit her first milestone. She all of a sudden became really fussy and grisly. The Wonder Weeks told us she was going through a change and what to expect – it helped immensely and gave us first time parents tips on how to help her through it. We set up family sharing with our iTunes so we can share this app together and both track her development (in fact I think she hits another change soon!) You simply pop in the childs D.O.B and other info and it sorts all out for you. What apps or technology tools have you discovered and love? How is your day going? Mine has been a little rough since 2am. Cluster feeds until 4.30am. Then, in and out of sleep till about 8am when she relaxed and we both had a better rest. However, she has gone for a good sleep again now and I have washed my hair, eaten something decent (bruschetta – yum!) and am now sipping a tea. We usually do tummy time and mat time in the mornings. Today we had a small mat time session but she got upset after a few minutes and I didn’t push tummy time. Hopefully, after this sleep we can enjoy some time together and get those neck muscles working. 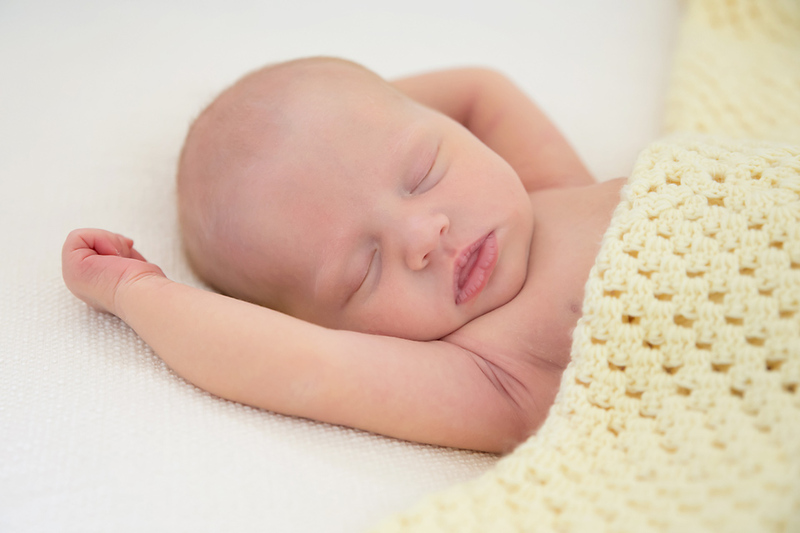 So, having a newborn is a whole new experience – especially at night. She got herself into a wonderful habit by about 5 weeks of only waking once during the at around 2am. Then quickly moved that feed 4am, again I had nothing to do with it, she asked and I fed and was thankful. But the past week she has moved back to a 2am feed and then is up and only taking short naps until about 8.30am – meaning I am awake from 2am. My sister leant me Save Our Sleep by Tizzie Hall. She thought it helped get her girls into some routine, but did highlight that she didnt follow the routine to the exact minute, she used it as a guide. Feeling a little weary, I had a read and gave it a go. 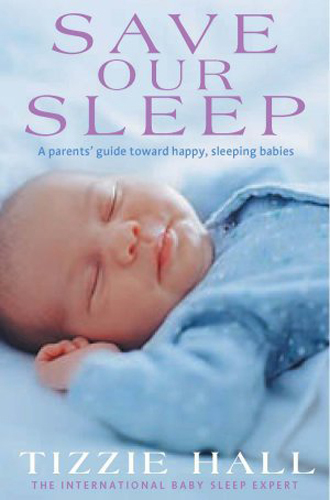 For those that dont know, Tizzie Hall is known as a bit of a ‘baby whisperer’ around the globe and her book is quite popular through parenting searches. She has a different routine for the different stages of your baby. The ultimate goal is to get them into a sleeping pattern, hence the title. The book itself was clearly laid out and wasn’t confusing to follow at all. I read it a couple of times and copied the relevant pages to put on the fridge so I could easily glance at it through the day. The first day, I followed it pretty much to the minute, as best as I could. I found she fell into line pretty quickly but at 2am she woke and this time was absolutely wide awake ready for mat time, tummy time and was all grins. I stayed calm and quiet and whispered but that little munchkin stayed awake until 4.30am when she consequently crashed out until about 6am. The next day we had a doctors appointment and so the routine was a little skewed but I did start to pick up times that she had big sleeps. Reading Tizzie’s book I realised her short nap should be in the afternoon. This was something I hadn’t even thought of, but totally made sense! I made sure she was awake by 5.15pm as the book suggested and she hung out in her bouncer or with her daddy when he got home until it was time for the night sleep. I can honestly admit I didn’t know when Bonnie slept or for how long for. The first six weeks looking back were a blur and when she was hungry, she fed and when she fell asleep, she slept. After a few days following the routine I realised it wasn’t really for us. However, it really highlighted her sleeping patterns and I did use it as a loose guide for her during the day and it has helped. She now tends to have two big sleeps in the morning, generally going down at 8.30am and 1.30pm for about 2 1/2 hours at a time. I am not adament she goes down at that exact time, however, I know if she starts grizzling then, tiredness is the likely cause and a good hug and rock puts her out. The book did help her (and me) to go down in her sleeper while awake and not once she has fallen asleep in my arms every time. I have learnt that I can lay her down and sit with her and she will happily lay down and nod off. I do still nurse her to sleep as well. The bath time suggestion for her age was 5.40pm. For us this doesn’t work. My husband gets home around 6pm and I like to have dinner as ready as I can and have her changed into night clothes and ready for handover. Once hubby gets home those precious few hours together seem to fly by and we both want them as enjoyable as possible. Things got chaotic trying to finish and eat dinner and do bath and settle for the evening. In our house, baths work best in the morning. When she is older we hope to transition to a night routine. We found that getting her to sleep for 7pm was a task and she was really ready by 8pm so we have allowed for that change as well. We do still ‘dreamfeed‘ at 10pm though to try and push her sleep out longer. Have you followed a sleep routine? Did it help you? Gemma here. Curator of this blog and currently first time mumma bear to a beautiful little girl (Bonnie Mae.) Having a career before becoming a full time mummy I knew I would still want to dabble in something, but I didnt know what. As soon as I was home from hospital nearly 7 weeks ago I knew it was a blog. However, it has taken me this long to find the time to start one. Yep, I am still playing with the look and feel but it is up in the big wide world. These are my experiences and my thoughts on subject matter relating to all things parenthood and they may relate to you or even help (yay!) On the other hand something may not and this isn’t a blog to tell anyone how to do anything. One thing I have learnt in my first 7 seven weeks is that EVERY baby and EVERY parenting experience is different and what might be awesome for one bubba/mumma might be the absolute opposite for the pair next to them.